The truth is, while dark chocolate may have more health benefits, those health benefits won't matter if you eat an entire bar of it, when what would really satisfy you would be 1 piece of milk chocolate. So my answer to this question typically is: whatever chocolate you love the most. For me, for example, I love milk chocolate. So that's what I buy, and I can easily stop myself at one piece, because I'm so satisfied with how it tastes, and its mouthfeel (how it feels in my mouth). HOWEVER! It's also true, that if you like a number of different types of chocolates, it may be better for you to choose one you like a little bit less, if that helps you stick with a controlled portion size, like one or two squares. Regardless, I do generally think that buying single-serving desserts is best. This can be individually-wrapped Hershey's kisses, Ghirardelli squares, 100-calorie "mini" chocolate bars from Trader Joe's, etc. Truly, whatever works for you, works for YOU! With anything, I always try myself to buy pre-packaged portion controlled foods, or make my own small baggies (to save on excess packaging). I recommend clients do this as well, and to do this in my course! Navigating grocery stores can be overwhelming. Simplify the process with these great finds! —low carb, high protein, and convenient! It's somewhat annoying, but very true: controlling portion size is really key. Anything in excess is excessive, no matter if it's whole wheat pasta, apples, carrots, or chocolate. 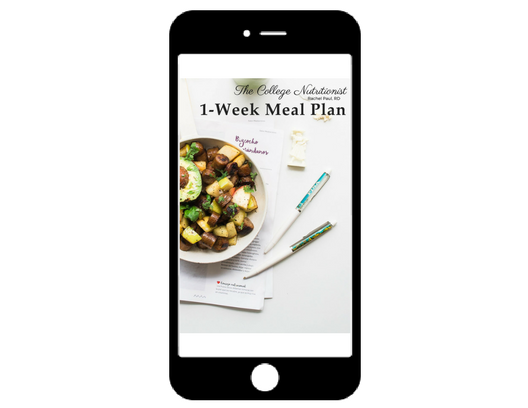 With clients and in my online course, we talk about portion size, and some go-to resources to help. WebMD has some fabulous guides to help. Here's a Link to the full resource: http://www.webmd.com/diet/healthtool-portion-size-plate - and they have a one-pager that you can post on your fridge or keep on your computer or phone. The website ALSO has some really great VISUAL examples of correct portions by food group, here are some of my faves. Images here are (c) WebMD.